The eye-catching design of our United States maps and well-developed functions allows the map to operate flawlessly, while the built-in opportunity to adjust colors, fonts, headlines and descriptions allows you to fit the map into the layout of your presentation. 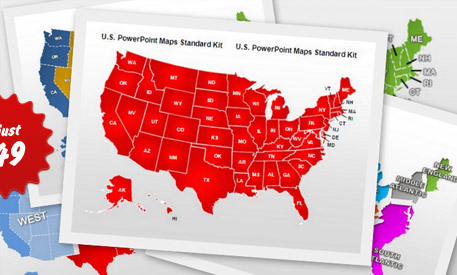 The map kit comes with a number of slides already included: a USA map with states, USA maps divided to regions, U.S. + Canada combo maps plus outline maps and a color highlighted states map. The range of application of this map is virtually limitless. Indeed, you can display your current standings in each state or county; you can create the map of your dealership network or call centers; a territory map or a heatmap; a geographical presentation or a competition analysis - and many more. 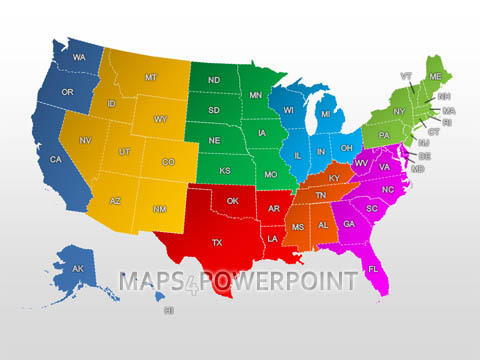 The download link to your PowerPoint map will be e-mailed to you directly upon purchase. The process is instant, meaning you'll get your map a minute after you have placed the order.